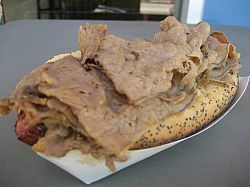 Being a native Chicagoan I have automatic “street cred” when it comes to judging a good hot dog. Honestly, the very first week I settled in Los Angeles thirty-three years ago, I began a search for a hot dog joint that would compare to any of my favorite Chicago haunts. 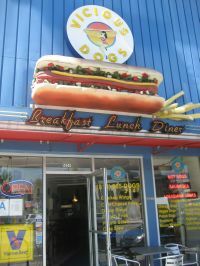 I discovered a few places, and some have disappeared over the years, but I’m pleased to say they are serving up wieners worthy of Chicago status at VICIOUS DOGS in Noho on Lankershim. True enough there’s no age limit when ordering a hot dog at Vicious Dogs. Half a dozen kids were clamoring at the counter the day I was there, along with a crowd of parents, neighborhood hipsters, teenagers, and theatre-goers on their way to the El Portal. To be fair Vicious Dogs serves way more than “Chicago” style sausages. In fact, their abundant menu that includes four varieties of Louisiana hot links, turkey dogs, chili, hot wings, Italian beef, Italian sausage, and six vegetarian sandwiches for the non-meat eater astonished me. The bill of fare also includes their house specialty (recommended by Willie and his counter staff Amanda and Alonso) the sweet and spicy Kielbasa ($4.99). Regular customer John Kephart of North Hollywood described it as, “A little slice of heaven with a sweet chili glaze.” Another interesting item with a Latin American slant is the “Doggy-wrap,” two bacon wrapped hot dogs in tortillas with Chipotle sauce ($3.99). 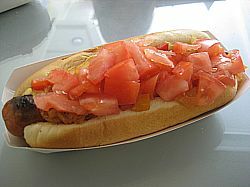 But I wanted a Chicago dog in the “wurst” way ($3.99). To the uninitiated that’s a Vienna beef hot dog with mustard, relish, onions, tomato, pickle, and hot peppers on a poppy seed bun. (Note: The wise epicurean should always get the peppers on the side to test the heat ratio first.) To top it off I uncharacteristically ordered a “half” order of beer battered onion rings ($2.49) instead of fries. In short, the hot dog was perfect, and the half order of rings was gigantic. I took most of them home. “We want to please our customers,” Willie remarked. 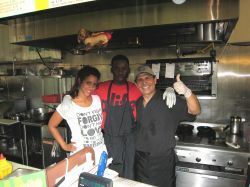 Vicious Dogs is a no-frill place with a genuine neighborhood feel and great food. Willie the owner has a kind word, a snappy comeback, or a warm greeting for every customer.